You won’t find this massage anywhere else! 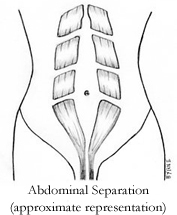 This is a service marked massage which will bring your rectus abdominus muscles back together after the separation that occurs in almost all pregnancies. It helps flatten the “bulge” or “shelf” left after pregnancy and will relieve your body of the physical and emotional strains that carrying and caring for a newborn creates. Five or six sessions is typically required to bring the stomach muscles back together, and these massages also eliminate back pain caused by the stomach separation. Additionally, down time is so necessary for the new mom! This treatment series provides a cherished hour of “me time” that is so needed and deserved by new mommies. When coupled with the Belly Bandit (shown above), our 6-session series returned moms to their pre-pregnant waistline size (98%). We offer a significant discount on our 6-session Post-Partum series. Please call the spa for our current low price on the Belly Bandit.